Land subdivision is a bit like helping Mom slice up her beautiful Apple Pie; it’s all so easy when, like Mom, you’ve done it a few times. So let’s see if we can get the ingredients correct so you can do it right first time, OK? Just as you can’t build a house anywhere you like, you can’t have a farm or a factory in the middle of a residential area either. So the first thing you must do is find out what is the ‘Zoning’ of the land you own or are thinking of buying. Getting land Rezoned is another issue altogether. Let’s assume your land is zoned for residential housing. The Town Plan will tell you all the requirements you have to undertake for land subdivision. It will tell you the minimum Lot size allowed in a residential subdivision. It will tell you the distance in feet or metres you have to Set-Back each lot from the road, either internal and/or external, as well as the side boundaries of your land. Now all that seems a bit complicated, but don’t worry, there are professional land subdivision experts who will do all this work for you. Depending in what part of the world you come from, you will engage either an Engineer in the USA or a Land Surveyor in Australia, New Zealand, UK or Ireland to prepare you land subdivision plan. Always engage one who does their main work in your area, because these are the professional where local knowledge is very important. They will know about soil conditions in your area, because they may have done several land subdivisions in the area already and completed soil testing. They will also know about the provision of utilities like water supply, electricity, gas, telephone. All of these impact on the cost of your development. For example, if water reticulation is not available on your road frontage and the nearest water supply is a mile away, then you may have to pay for the cost of piping water that distance. So what does all that add up to? Yes, you should go the Local Authority in your area of the world that handles Town Planning and study their Town Plan. You may even be able to get a photo copy of that area of the plan that concerns your land. Read the local By-Laws about the type of land subdivision you plan to do. 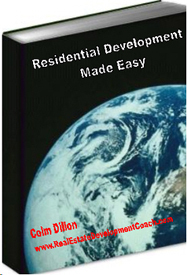 Next, if you don’t have a recommendation as to which Engineer or Land Surveyor to use, do as I suggest in my e-book, Residential Development Made Easy, go and interview several of them in your area. Remember, as you are low on experience, the interview is your opportunity to find someone with whom you feel comfortable on a personal level. Do they ‘talk down’ to you and treat you as though you’re a mug? Are they information givers? Do they explain things to you? What land subdivision are they currently working on? Where is their most recently completed land subdivision? You don’t have the expertise in the profession, so use you own instincts. When you find one that suits you, Do Not start off your relationship, by attempting to haggle over the professional fees he proposed to charge you. If you have interviewed several professional you will know the range of fees charged, BUT you do not know the extent or range of work the firm has to carry out. So to haggle with a professional based on such skinny information, tells the professional that they should avoid you by a mile. I have developed over $1.2 Billion worth of real estate and have never in my life haggled over a professional fee and the reason is simple. First: I believe everyone is entitled to a profit from their endeavors, provided they do a good job. Second: If you land subdivision financial feasibility study is so marginal that you have to save a few thousand dollars by screwing the fees of your professional consultants, then either you have a bad development or you are just a bad employer. Third: I believe in incentive. I prefer to pay a guy more than he asks. Guess how he performs for me as opposed to clients who don’t.